Inspired by the recent articles on Saturday Live and the Today Programme, on Easter Sunday, Pink and Blue decided to visit the V & A Museum of Childhood to see their “Game Plan: Board Games Rediscovered” exhibition. Catching a train from Oxford Parkway and negotiating the London Underground, they arrived in Bethnal Green. With its vaulted ceiling and exposed metal work, the Museum building looks for all the world like a re-purposed Victorian Civil building, a train station, swimming pool or maybe some sort of pumping station. Much to their disappointment, however, after extensive discussion and investigation, it turned out that the building was designed for the purpose, albeit after relocation of parts from “Albertopolis” on Exhibition Road. The exhibition itself was well presented and occupied a sizeable portion of the overall floor space. Although it was located in one of the upstairs galleries, the exhibition was well advertised and, from entering the main hall, games were brought to the visitors’ attention with table space and signs offering the loan of games should people want to play. It wasn’t an idle promise either, as there were several family groups making full use of the opportunity, albeit playing what might be called classic games rather than more modern, Euro games. A quick look at the model train cabinet and brief spell side-tracked by one or two other exciting toys preceded entry to the exhibition which was shrouded by an eye-catching red screen. The first exhibit was a copy of Senet, arguably one of the oldest games in the world – so old in fact that we’ve lost the rules and nobody knows how to play it. This was followed by some traditional games including a beautiful wooden Backgammon set made in Germany in 1685 and decorated with sea monsters and a lot of fascinating Chess sets, old and new. Next, there were some ancient copies of Pachisi (which evolved into Ludo) and Snakes and Ladders, both games that originated in India and were originally played seriously by adults. Further round there were many other curious games, for example, The Noble Game of Swan from 1821, which was an educational game for children, itself developed from the much older, Game of the Goose. Education was a bit of theme and there were a lot of games from the nineteenth and early twentieth century designed to teach geography in some form or another. These included Round the Town, a game where players had to try to cross London via Charing Cross, and Coronation Scot, a game based on travelling from Glasgow to London inspired by the eponymous 1937 express train made to mark the coronation of George VI. Progressing through the late twentieth century, there were the inevitable copies of the childhood classic games, including Game of Life, Risk, Cluedo, Mouse Trap, Trivial Pursuit, Connect 4, Scrabble and the inevitable Monopoly, all of which risked bringing a tear to the eye as visitors remembered playing them as children. The exhibition eventually brought us up to date with modern Euro-style games, presenting copies of Ticket to Ride, Carcassonne and Settlers of Catan. More interestingly, there was also an original prototype of Pandemic supplied by the designer, Matt Leacock, complete with his scribbles and bits of paper stuck over infection routes he decided to remove as the game developed. One of the final display showed how the influence boardgames have had on the computer gaming industry is sometimes strangely reciprocated, with a copy of the Pac-Man game, including the title figure wrought in sunshine yellow plastic. 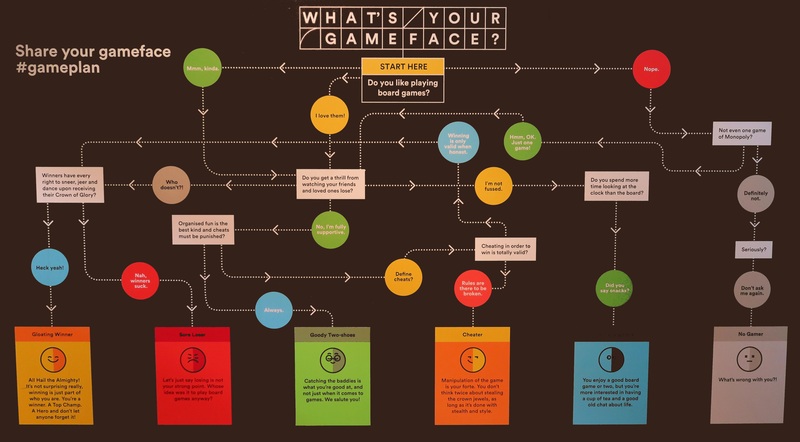 Leaving the exhibition, there was just one last game – “What’s Your Gameface?“. This cute flow chart entertained Blue and Pink for far longer than is should have as they tested it out with all their friends, relatives and fellow gamers (nobody came out as “Cheater”). The Exhibition is only open till 23rd April 2017, so there isn’t much time left and it is well worth a visit. This entry was posted in News and tagged 3 Sind Eine Zu Viel!, Backgammon, Carcassonne, Chess, Cluedo, Connect 4, Coronation Scot, Game of Life, Game of the Goose, Mijnlieff, Monopoly, Mouse Trap, Pachisi, Risk, Round the Town, Scrabble, Senet, Snakes and Ladders, The Noble Game of Swan, The Settlers of Catan, Ticket to Ride, Trivial Pursuit, Tufty Road Safety Game on April 20, 2017 by nannyGOAT.